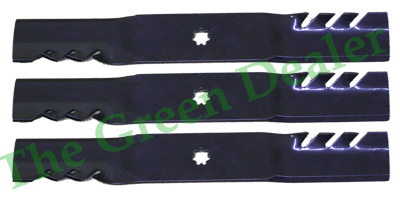 Gator Mulching Blades that fit a John Deere 54" deck on the 190C, G110 and LA150 series tractors that are sold at Home Depot as well as John Deere dealers across America. Gator Blades feature teeth on the back side of the blade. These teeth do not cut the grass a second time, they redirect the airflow under the deck to bring the grass clippings back towards the center of the blade to be cut again. This results in shorter clippings and less windrowing (Piling up of grass) as it comes out of the deck.